BLOOMINGTON, Ind. (USA) -- Tributes continued Monday following the death of Muhammad Ali – including at Bloomington's Tibetan Mongolian Buddhist Cultural Center. 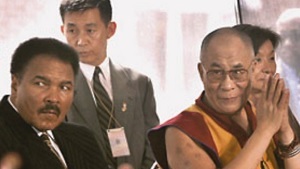 The center was the site of a 2003 meeting between the former boxing champion and the Dalai Lama. Ali visited the center as a guest of the Dalai Lama to dedicate an interfaith temple. To those that knew the former champ, it was only natural for him to embrace leaders of other faiths. "He came here and represented and they invited His Holiness, and they had together wonderful events," said Arjia Rinpoche, the center's director. "So that all represented peace, and in the world, we need peace and harmony and compassion. So it was very meaningful." A devout Muslim, Ali used the power of his celebrity on a global scale, saying he wanted to be more than just a boxer. "We should all remember him and follow his steps and do something for the world," Arjia Rinpoche said.